Let’s just say right off the top, if you’ve already heard of John Waters and have seen and didn’t care for his movies, you probably will not like this book. If you weren’t offended by his films (Ok, if you might have been just a bit moderately offended but not totally disgusted to the point that you could no longer watch), this book could be right up your alley. For me, it certainly was! I loved it, laughing harder than I have in months. Maybe even years! Crammed full of carnival oddities, raw direct adult language, filth (both general and specific), the grotesque, and other assorted deviances, this book is definitely not for the squeamish. 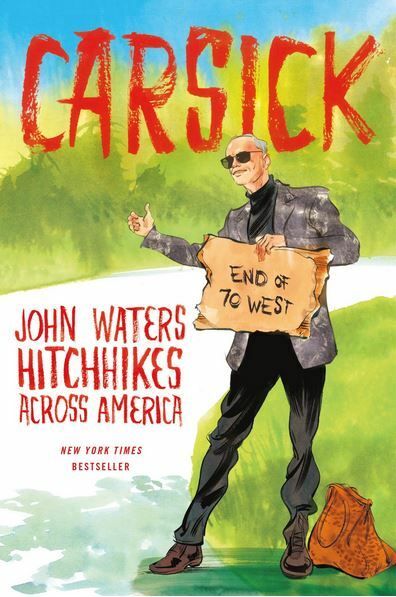 Consisting of various explicit stories told in the most humorous of fashions, the basic premise is that Waters (often called the Pope of Trash or the People’s Pervert) hitchhikes from his home in Baltimore to his second home in San Francisco and then details his experience on the road. The first two parts of the book are fiction and are told in a fashion very Waters-esque, living up to his aforementioned unofficial titles. Part one is a chronicle of what his journey across the country would be like from a best case scenario perspective; part two from a worst case perspective. The final third of the book details what actually happened in his hitchhike across the country. We salute and thank you, John Waters (and my local library for including this book in the collection), for feeding the soul of the low brow reader. I really enjoyed his memoir “Role Models” a few years back. I didn’t even know we had this book until a patron returned our CD book copy and said. “This audio book nearly made me CARSICK!” You are right, John Waters isn’t for everyone. I’m glad I saw your review, it reminded me to add this to my list!